Window World has once again been honored with the Good Housekeeping Seal for its superior products. NORTH WILKESBORO, N.C. — After 10 consecutive years of earning the Good Housekeeping Seal on our windows, Window World® is thrilled to announce that not only have we continued the tradition of success for the eleventh consecutive year, but we have been awarded the Seal on all of our core products such as windows, doors, and siding. The Good Housekeeping Seal is an accolade that honors reputable products that exemplify both quality and value. Earning the Seal showcases our commitment to providing industry-leading products for our customers. Because of its popularity and credibility, the Good Housekeeping Seal is widely regarded as a resource for helping consumers choose the best solutions for their homes. We are proud to accept this award and we look forward to continuing to provide the highest quality of remodeling products to homeowners throughout the country. Window World continually strives to build on the quality of products and the services that we offer. 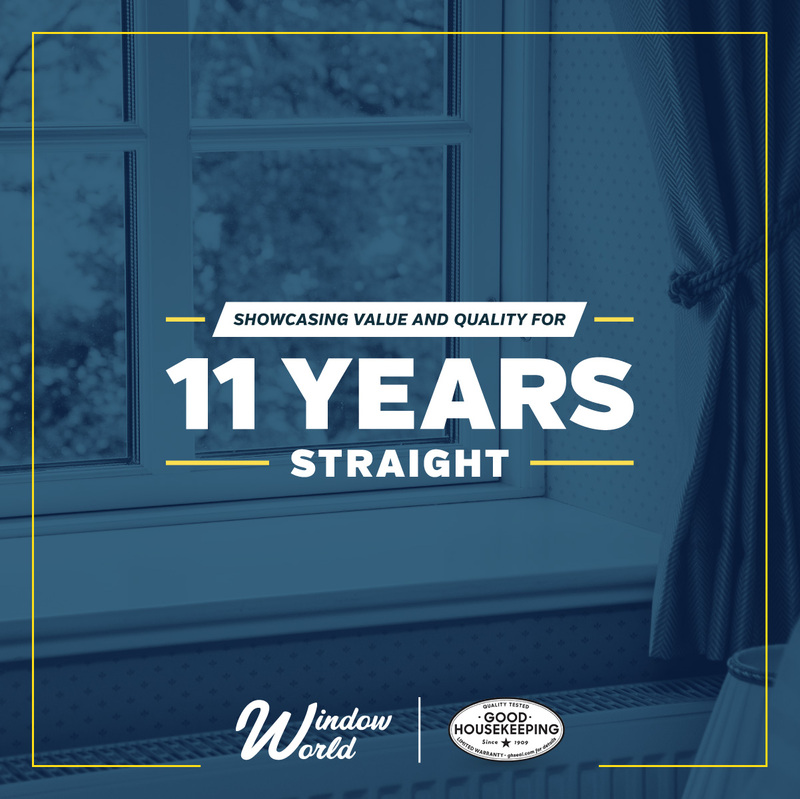 The Window World promise is to provide superior products that are professionally installed at a guaranteed low price, and this latest achievement is a testament to that commitment. Founded in 1885, Good Housekeeping magazine reaches nearly 25 million readers each month, plus another 10+ million online at goodhousekeeping.com. The Good Housekeeping Institute, a state-of-the- art consumer product testing facility launched in 1900 and staffed by engineers and scientists who evaluate thousands of products each year in its six labs, is key to the unrivaled trust that readers and consumers have in the Good Housekeeping brand and the Good Housekeeping Seal. The Seal, introduced in 1909, and the Green Good Housekeeping Seal, created in 2009, are among the most recognized consumer icons and are backed by a limited warranty that provides a replacement or refund for up to $2,000 if a product proves defective within two years of purchase. In addition to its U.S. flagship, Good Housekeeping publishes 10 editions around the world. Hearst Magazines is a unit of Hearst Corporation, one of the nation’s largest diversified media and information companies. With 21 titles in the U.S., Hearst is the leading publisher of monthly magazines in terms of total paid circulation (AAM 2H 2014) and reaching nearly 81 million adults (Fall 2014 MRI gfk) and nearly 44 million site visitors each month. Follow Good Housekeeping on Facebook, Instagram, Twitter, Pinterest and on the Inside the Institute blog. Window World of Pittsburgh is locally owned and operated in Pittsburgh, PA. Window World is an ENERGY STAR® partner and its window products have earned the Good Housekeeping Seal for ten consecutive years. The store, located at 6504 Steubenville Pike in Pittsburgh, PA, serves homeowners in the counties of Allegheny, Beaver, Washington & Westmoreland. For more information about Window World of Pittsburgh, visit windowworldpittsburgh.com or call (412) 533-5753. "I hired Window World for an install of three extremely large slider windows. These are windows other companies said could not be done. The windows were installed over the course of a day and a half, and the installers exceeded my expectations in every way, as did the quality of the windows! I highly recommend them to anyone!" "I had two windows that I haven't used for over 30 years. One of the window panes actually blew out during a wind storm. I called Window World and Wayne was great! They were very professional, friendly, cleaned up all the mess and did a GREAT job! Thank you Window World, we will definitely go back to you when we need new replacements!" "Fantastic results, the life time warranty is what sent Window World to the top in our home. The seller explained every detail of measuring to installation to clean up. The install crew we polite and showed every step of the install. Would highly recommend to all. And the PRICE can't be beat. Thank you Window World."